If you are travelling to Disney World with toddlers & preschoolers, you are probably wondering whether or not you will need a stroller at Disney. There are many reasons why you should have a stroller if you are travelling with small children and since there are Disney World stroller rental options, you don’t have to worry about bringing your own! Each one of the Disney parks is pretty expansive and you need to prepare for a lot of walking. When you think about it, little ones do nearly double the walking that we do as adults because their little legs have half our stride. The last thing you want is an overtired child whose little legs can’t take the pace of a trip to Disney. It is a recipe for disaster! When you are trying to maneuver through the Disney parks, you are going to find that you will be able to keep up with your kids better if they are sitting in a stroller. If you have little ones who still nap, you will appreciate that the Disney World Strollers are roomy and make napping less of a struggle. I think you will find that kids get worn out from all the excitement and tend to fall asleep on their own when they are in a stroller. Stroller are awesome for the Disney parades. You can park the strollers right near the front of the parade rope and kids can sit comfortably (and even enjoy a snack) while the parade is going on! Florida is hot and the strollers that Disney provides have a hard shell cover that provides some shade for their face and upper body. Probably the best reason for using the Disney World stroller rental is because it comes with storage! You can put all your gear in the stroller so you don’t have to lug a bag over your shoulder or on your back the whole day! Purchase a Length of Stay Disney World Stroller rental ticket for less per day when rented for multiple days and paid in advance. All you will need to do is show your receipt at each park to receive your stroller for the day. 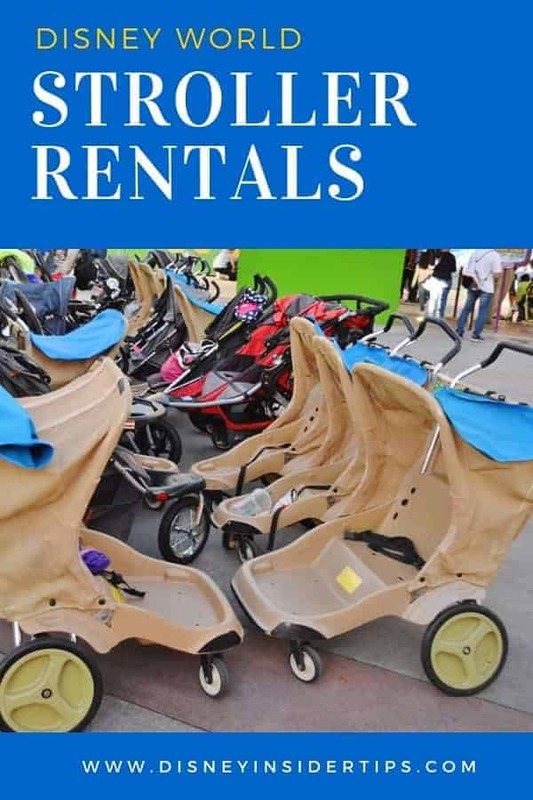 You can also rent strollers from third party vendors for a discounted amount, but for us it was always easier to use the Disney World stroller rentals and in our opinion, they were larger and better suited for our needs. 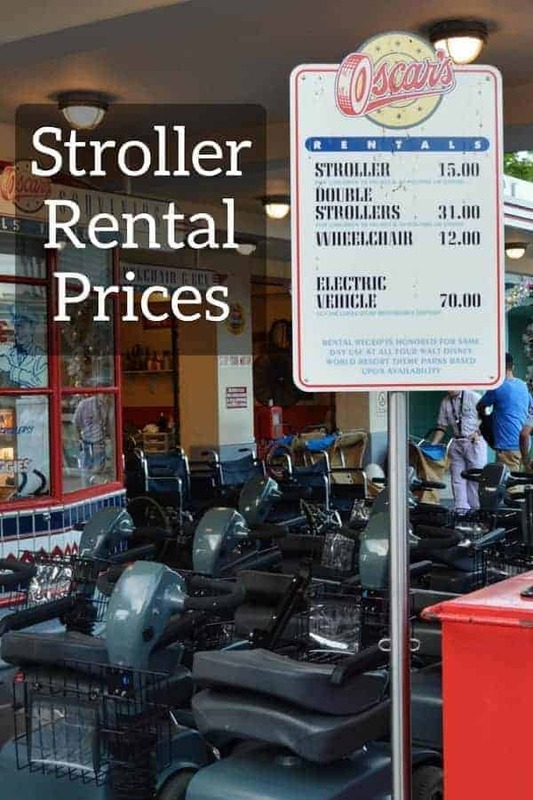 No matter which choice you make, you will find that the park is overloaded with strollers and each time you get on a ride, you will have to park your stroller before to getting on the ride. Now, this doesn’t seem like a big deal because it is pretty easy to find a place to park it. The problem arises when you go back to retrieve it. What you are going to find is that while you were away, chances are a cast member may move your stroller to a different location. The purpose for this isn’t to confuse you. They are trying to organize the strollers so that no space is wasted. This is great for them, but can cause your a problem when you come back to retrieve your stroller. You just might find yourself looking through 50-75 look-a-like strollers before you find yours. Bring a piece of bright colored ribbon to tie to the handle. The ribbon makes your stroller stand out from the rest and much easier to spot! When you look out at the sea of strollers, the only thing you really see is the top canopy and the handle. 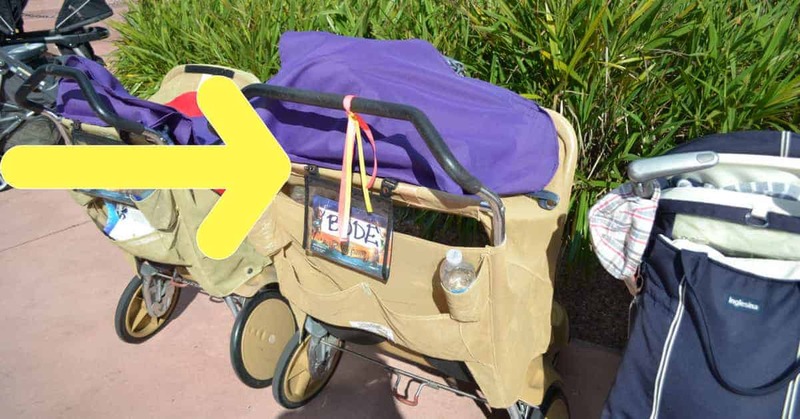 By having a bright ribbon tied to the handle, you’ll be surprised at how much easier your Disney World stroller rental will be to find! So, do you think you will need a stroller at Disney? I’d love to hear your thoughts! Yes, Balloons are great, especially if you have a colorful one that stands out! Another recommendation I got from a friend was to buy an inexpensive flashing bike tail light to attach to the stroller. Get the kind with a stretchy silicone band to attach it. It made the stroller easy to find at night in stroller parking lot after the CM had moved it. What happens when you are park hopping. Do you have to re-rent the stroller? No, you will be given a ticket (or it will be loaded on your MagicBands) so you can go to the next park & just pick it up. Is there a lot of theft with your belongings in the stroller? No. I wouldn’t leave anything too valuable, but generally speaking Disney is a pretty safe place all together. The strollers are usually all kept together so it would be strange to see a single person in that area. Most people who have strollers have too much of their own stuff to worry about looking through someone elses.